What this translates to is that when we moved into the Gulf of Mexico we went to the Central Time Zone. That means only a 2-hour difference between the ship and my home in the Pacific Northwest. That also means I, who am on the noon-to-midnight shift, got one more hour to sleep (or whatever) Sunday night. I am busy learning about schedules on the ship. The science group is split into 2 shifts. We work days: noon to midnight; or nights: midnight to noon. These hours rule our lives. Meals are served at 0630, 1100, and 1700. You eat your first meal before you go on shift and your last at shift’s end. During the 12 hours you are off shift your stateroom is yours and your roommate is expected to stay away and let you sleep. The opposite is true for your time on: take everything you may need with you when you leave. Showers, laundry and personal business are fit into your 12 hours off. Shipboard courtesy requires that we keep voices low in the passageways and be careful not to let doors slam. Somebody is always trying to sleep. There is always a quiet spot somewhere to relax for a moment if you get the time: on the flying bridge, at the table on the stern, in the lounge or at a galley table. Sunday, at 1230 hours, we had safety drills, required for all personnel within 24 hours of departure and once a week thereafter on every cruise. Reporting stations for 3 different types of drills are posted in staterooms and throughout the ship. Nobody is exempt from participation. The signal sounds: a 10 second ringing of the bell: FIRE! 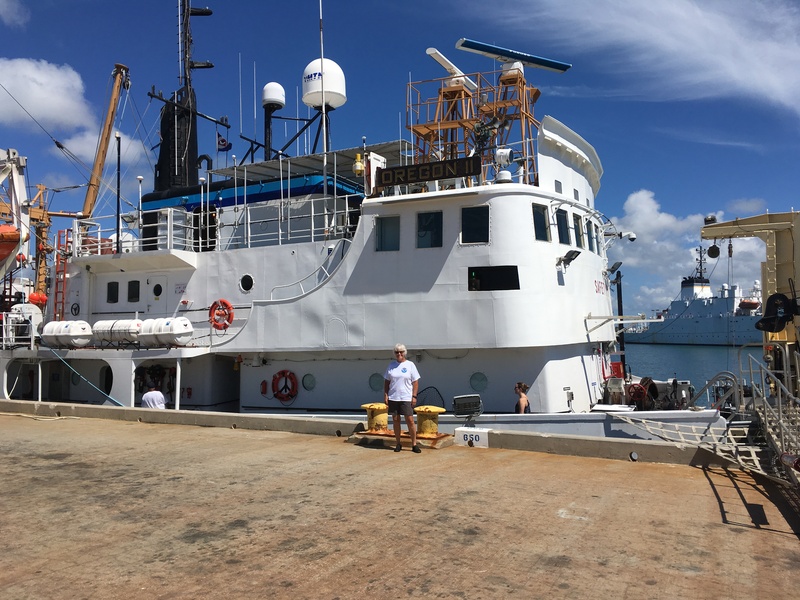 The PA announces a drill: “All hands report to assigned stations.” Members of the science team quickly make their way to the stern. By the galley stands a crew member with a sign reading: Fire ahead – detour. After we arrive at our station, get checked off and, when all crew have been accounted for, return to our staterooms. Next – 7 short and one long ring on the bell: ABANDON SHIP! Announcement: “Drill. All hands report to the bow with PFD’s and survival suits.” We grab our life jackets and “Gumby suits” and head to the bow where we are checked off as we arrive. We are required to don our “Gumbies” in 2 minutes or less – not impossible, but not simple either. I’ve done it before. The hardest part is getting the hood on and zipping up with your hands jammed into the lobster-claw gloves and your shoes and hat crammed into the suit with you…that’s when you discover just how much too long the arms and legs are. It isn’t pretty, but if we actually end up in the water, those neoprene suits will be our best protection against the deadly, energy-sapping effects of hypothermia! Just after we have stripped out of the “Gumby” suits, rolled them up and stowed them and our life jackets back in staterooms, we get the next signal. 3 long bells: “MAN OVERBOARD!” This drill is important too, but feels almost like an anti-climax. It could mean the difference between life and death to a fellow crew member who falls into the water when the ship is moving. Science team reports again to the stern and, in a real emergency, would receive instructions for participating in spotting or assisting in a rescue. This time we stay and listen to a safety talk about our work with long lines, hooks, bait, and our possible catch which could include all kinds of fish and sharks. There are very definite rules and procedures to ensure crew are safe and our catch is handled with care and respect. If all goes well…our first lines will be set Monday night! Sitting on the flying bridge about 1900 Sunday evening, 3 of us spotted a small boat about ½ mile away that seemed to be drifting aimlessly. There were two enormous cruise ships coming up behind us and they went around it on either side after cutting their engines to reduce their wake. A crew member from the bridge watched from our deck as somebody on the boat fired a flare. We were informed that radio contact was established: the boat was adrift, out of fuel, and we would stand by until the Coast Guard arrived. The OREGON II cut speed and circled back to stay closer to the small boat. One of the cruise ships was also standing by while the other went on its way. After about 20 minutes the white and red Coast Guard ship appeared and, when it reached the small boat, we were released to go on our way. Seeing this response to another vessel in need of help put emphasis upon the importance of participating fully in our drills and understanding the measures in place to keep us safe and aid other ships sharing this big ocean. Did You Know? What is the largest shark found in the Gulf of Mexico? This entry was posted in 2016, Barney Peterson 2016, NOAA Teacher at Sea and tagged longline, NOAA Ship Oregon II, red snapper, shark. Bookmark the permalink.